Post your ideas on a business model canvas or a customer service journey canvas. Move notes, finetune ideas and create variations. All changes are synced for all users with the same canvas opened. 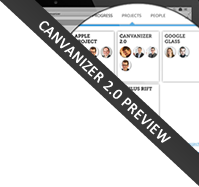 Choose from many pre-structured canvas templates. Clone canvases and iterate dynamically. Post read-only for public feedback on blogs.